What are Motor Vehicle Injuries? Prevalence rates report that as many as one in every ten individuals are expected to develop chronic, widespread pain in a four year period. Further, of those individuals reporting new onset chronic pain, about half reported that their pain resulted from either a motor vehicle accident, surgery, or fracture. Accidents involving motor vehicles are extremely common, with estimates suggesting that that up to 70% of U.S. adults will be involved in a motor vehicle accident at some point in their lifetime. Moreover, between 5-7% of individuals injured in a motor vehicle accident are reported to be at least partially disabled as a result of injuries sustained in the accident. Worldwide, estimates suggest that almost 50 million individuals are injured in motor vehicle accidents every year. The most common cause of pain following a motor vehicle accident arises from the cervical facet joint, followed by disc pain. Indeed, there is a subset of patients who report experiencing both cervical facet joint pain and disc pain following a motor vehicle accident. Other injuries that frequently occur as a result of a motor vehicle accident include bone fractures, ligament tears, head injuries, internal bleeding, abrasions, and spinal cord injury. In addition to physical injuries, patients involved in motor vehicle accidents are also at risk for suffering from acute stress and posttraumatic stress disorder, which has the potential for exacerbating symptoms of pain. Historically, the most common injury occurring as a result of motor vehicle accidents is whiplash, which affects the cervical facet joint. This injury occurs as a result of sudden acceleration-deceleration force, which may lead to chronic neck pain. While not life threatening, whiplash can lead to prolonged partial disability and chronic symptoms that may persist for several years following the original injury. Recent studies utilizing high-speed cameras suggest that rear impacts force the lower cervical vertebrae (found within the lower neck) to hyperextend while the upper cervical vertebrae (found within the upper neck) are hyperflexed, creating an atypical curvature in the cervical spine. It is believed that this uncharacteristic motion of the spine leads to damage and irritation in the cervical facet joint and the surrounding soft tissue. Another common injury occurring as a result of motor vehicle accidents is disc pain or a degeneration of the disc. This injury occurs as a result of damage to the intervertebral discs within the spinal column following a motor vehicle accident. These soft, compressible discs act as shock absorbers, and contribute to the overall flexibility of the spine. As a result of injury, these cushioned discs become inflamed, compressed, and damaged, leading to chronic pain. There are many treatments available for the chronic and widespread pain associated with motor vehicle injuries. Indeed, for pain that is not severe or debilitating, it is recommended that patients attempt conservative, at-home treatments first to manage pain. More specific recommendations are often made depending on the type of pain. For the majority of chronic pain complaints, analgesics are widely utilized for effective pain management. Many studies suggest that victims of motor vehicle accidents who receive physical therapy shortly after sustaining an injury from the collision are more likely to maintain the long-term recovery of pain, range of motion, and overall function. For these patients, physical therapy will involve stretches and specific exercise routines. In general, patients with chronic pain following a motor vehicle accident may take a non-steroidal anti-inflammatory drug (NSAID) to alleviate their moderate pain associated with a motor vehicle injury. These medications are recommended because of their ability to reduce inflammation of the affected area that is associated with pain. Oral corticosteroids, such as prednisone and cortisone, may also be recommended to reduce pain and inflammation of the affected area. For patients who have not experienced pain relief following these more conservative therapies, more aggressive interventions may be warranted. Radiofrequency ablation, for instance, uses a high frequency current to disrupt the nerve function and interfere with the nerve’s ability to transmit information regarding pain sensations. 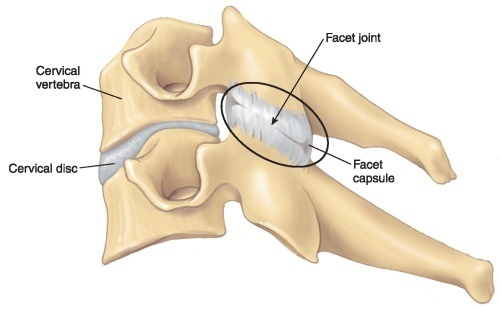 Medial branch blocks and facet joint injections may also be beneficial for pain management. 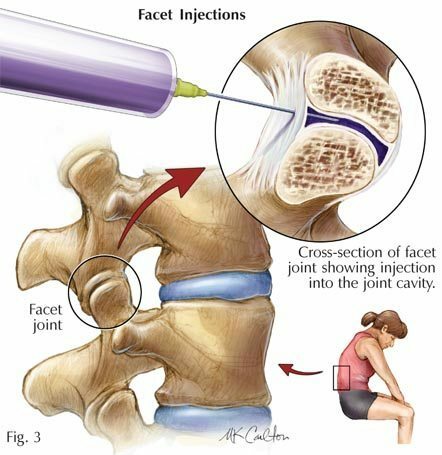 These procedures involve an injection into the facet of the spinal cord to block the transmission of pain signals to the spinal cord and brain. It is recommended that individuals involved in a motor vehicle accident receive early care to minimize the damage associated with inflammation. This not only will prevent further damage associated with the inflammation, but will also facilitate the repositioning and realignment of the joints and soft tissue affected by the injury. In terms of alternative techniques, biofeedback training has received support for helping patients manage their symptoms of pain. This treatment involves teaching patients relaxation and coping skills, thereby allowing them to gain some control of reducing their own symptoms of pain. Other alternative techniques, including acupuncture, are also thought to be beneficial for reducing symptoms of pain following a motor vehicle accident. Chronic pain occurring as a result of injury from a motor vehicle accident can persist for a number of years. 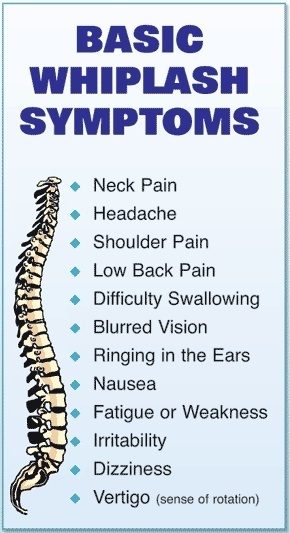 The most common conditions include whiplash pain and pain associated with injured intervertebral discs. There are a number of treatment options available for managing the symptoms of pain associated with injury from a motor vehicle accident. Patients are encouraged to speak with their physician about the details of their condition in order to determine the treatment plan that is right for them. Epstein JB, Klasser GD. Whiplash-associated disorders and temporomandibular symptoms following motor-vehicle collisions. Quintessence Int. 2011;42(1):E1-14. Laborde JM. Biomechanics of minor automobile accidents: Treatment implications for associated chronic spine symptoms. J South Orthop Association. 2000;9(3):187-92. McLean SA, Clauw DJ, Abelson JL, Liberzon I. The development of persistent pain and psychological morbidity after motor vehicle collision: Integrating the potential role of stress response systems into a biopsychosocial model. Psychosom Med. 2005;67(5):783-90. McLean SA, Williams DA, Clauw DJ. Fibromyalgia after motor vehicle collision: Evidence and implications. Traffic Inj Preview. 2005;6(2):97-104. Turk DC. A diathesis-stress model of chronic pain and disability following traumatic injury. Pain Res Manag. 2002;7(1):9-19. Schofferman J, Bogduk N, Slosar P. Chronic whiplash and whiplash-associated disorders: An evidence-based approach. J Am Acad Orthop Surg. 2007;15(10):596-606. Walton DM, Macdermid JC, Giorgianni AA, Mascarenhas JC, West SC, Zammit CA. Risk factors for persistent problems following acute whiplash injury: Update of a systematic review and meta-analysis. J Orthop Sports Phys Ther. 2013;43(2):31-43.